I have argued above that early primates were unusual mammals in combining small body size and a highly precocial reproductive strategy, and that these factors were related to their evolution of large relative brain size. But this was merely the foundation—or initial "grade-shift"—on which further brain size evolution occurred. It is fundamental to our understanding of primate brain evolution to emphasize that this characteristic of the early primates was "translated up" and elaborated at the larger body size ranges characteristic of more recent primate groups. Figure 9. Two schematic frameworks, one static (A) and one phylogenetic (B), each illustrating both the early increase in relative brain size observed in small early primates (short, thick arrows vertically directed), and the subsequent scaling or translation up into larger size ranges (longer, obliquely-directed arrows). In each case, early Tertiary mammals are represented by a trajectory with a slope typical of static mammalian series (2/3 - 3/4). In the case of a static grade shift (A), early to more recent primates scale at a rate typical of static extant mammals (2/3 - 3/4). With phylogenetic scaling (B), primates and other groups of mammals exhibit progressive increase in relative brain size throughout the Tertiary, but the effect is exaggerated in primates due to the upward transposition at small body size in the early primates. See text for additional discussion. for scaling or predicting brain size changes associated with body size differentiation across broad ranges in living mammals. Using this scaling criterion, the shift in relative brain size characterizing the early primates in comparison to other Paleogene mammals would result in later primates as a group also being transposed above their own contemporaries, yielding the pattern observed for extant mammals illustrated in Figure 9. This relationship expressed across broad size ranges is an example of the transpositions discussed by Gould (1966, 1971, 1975a; White and Gould, 1965) and later termed a "grade shift" by various authors (e.g., Martin, 1989). These grade shifts are merely shorthand ways of expressing higher or lower baselines of scaling at roughly comparable coefficients across body size ranges, and they were one of the earliest patterns recognized in broad studies of static brain-body allometry (e.g., Jerison, 1973). Static scaling principles do not define phylogenetic trajectories of brain-body scaling, however, as Gould (1975a) and Jerison (1973) have argued in some detail. Jerison (1973), Martin (1973), and others have noted that almost all eutherian lineages have evidenced progressive increase in relative brain size during the Tertiary. The causes for this relative increase in encephalization are not fully known, and the rates and bases of change vary considerably from group to group, as would be expected in any nonortho-genetic evolutionary framework. Certain progressive increases may actually be linked across groups (such as Jerison, 1973, suggested for carnivores and ungulates—but see Radinsky, 1978), while others are probably related to specific ecological contexts and other factors (e.g., Barton and Harvey, 2000; Clark et al. 2001; de Winter and Oxnard, 2001; Eisenberg, 1981; Jerison, 1973; Rilling and Insel, 1998). For our purposes here it is most important to stress that such phylogenetic scaling criteria would be expected to generally exceed the 0.66-0.75 range for broad static scaling coefficients. As illustrated in Figure 9, this "phylogenetic transposition" for primates would combine with their early high relative brain size to yield the generally high levels of encephalization observed in the order relative to other mammals. Thus, either in the case of static or phylogenetic scaling, it was the large relative brain size of the early primates compared to their Early Tertiary mammalian relatives that establishes a baseline elevation which is generally preserved and translated up to larger sizes as the primates and other mammalian lineages underwent adaptive diversification and increases in body size. This represents a fundamentally central "grade shift" in the evolution of primate encephalization and body size, but here we emphasize not merely the general tranposition, but rather the key adaptive shift in the early small-bodied primates. It is extremely important to stress that the above comments in no way are meant to imply that all brain size diversification within primate evolution is allometric, or causally related to body size changes. This would surely be an absurd claim. We cannot even say with any certainty that static interspecific scaling coefficients around the 2/3-3/4 value in mammals do not incorporate substantial adaptive increases in relative brain size which are merely correlated with, but not directly related to, increased body size. In other words, there may be considerable adaptive change in function and cognitive complexity along the central trend, and not merely away from it, as has often been assumed. We still have no corroborated criterion of "functional equivalence" which might convincingly account for observed exponents. Moreover, the phylogenetic scaling criterion depicted in Figure 9 exceeds the 0.66 - 0.75 allometric coefficient for static interspecific comparisons, and therefore, we must assume that the phylogenetic vector incorporates brain size changes associated with novel adaptive diversification. In fact, we know from quantitative genetic theory that any brain-body coefficient exceeding 0.33 in mammals provides evidence that selection has acted on brain size independent of its covariant developmental and genetic relationship with body size (Lande, 1979, 1985; Riska and Atchley, 1985; Shea, 1983, 2005)—and no slope exceeding the 0.66-0.75 range in a broad static series can be viewed as mere interspecific functional equivalence (Pilbeam and Gould, 1974; Shea, 1983, 2005). The fact that in many Tertiary mammalian lineages the adaptation and diversification of relative brain size and its components occurs in concert with adaptive shifts in body size is best viewed as a classic example of potentially misleading spurious correlation (see Fleagle, 1985, for discussion). 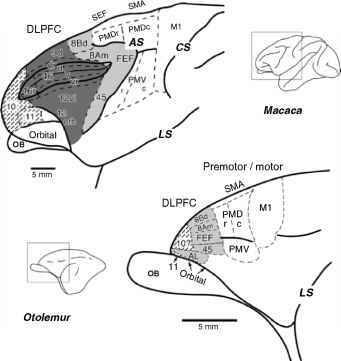 Jerison (1973) details many of the possible extrinsic factors influencing increase in relative brain size for various mammalian orders throughout the Tertiary. Within primates, the evolution of relatively larger brains in haplorhines compared to early primates and strepsirhines may also be correlated with the evolution of larger average body sizes. But these are general associations and not direct allometric influences. Factors such as complex sociality, extended learning periods, delayed maturity, and increased longevity, themselves perhaps linked to adaptations to new (including terrestrial) habitats, are most likely at least in part causally related to the changes in relative size of the brain and its components (Dunbar, 1998; Kudo and Dunbar, 2001).